Plugerville Branch President Johathan Kamenicky has been a lender at Citizens National Bank for over 15 years. 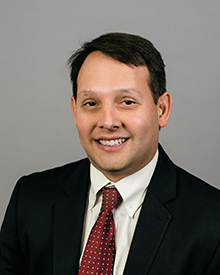 He is a graduate of Southwestern Graduate School of Banking, Texas Banking Association’s Management Development Program, and the Leadership Pflugerville Program. In addition, Kamenicky holds a Bachelor of Science degree in Agricultural Economics from Texas A&M University. Kamenicky strives to help customers find the right products for lending needs of all kinds, though his focus is largely on commercial lending. He believes in going “out of the way” to provide the best service possible while finding ways to say, “yes”. He is an active participant in the community and is involved in multiple groups including Pflugerville’s Chamber of Commerce. Outside the office, Kamenicky and his wife stay well-occupied with their 8 children. For leisure, he enjoys mountain biking and being active outdoors. In regard to one of his favorite activities, Kamenicky humbly describes himself as an, “above average golfer”.